9 races, 5 wins and placed 3 times. Won 7 467 024 FF. Retired to stud in 1991. SAUMAREZ stands now in South Africa. 6 wins. Prix de l'Arc de Triomphe (Gr.1), Coronation Cup (Gr.1), 2nd Irish Derby (Gr.1), Dewhurst St. (Gr.1), Eclipse St. (Gr.1), Craven St. (Gr.3), 3rd Prix du Jockey-Club (Gr.1), 2000 Guineas (Gr.1) King George VI and Queen Elizabeth St. (Gr.1). 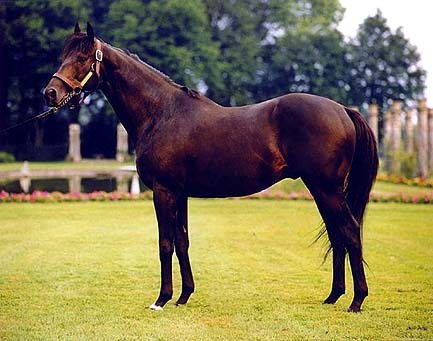 Retired to stud in 1986. - Isabelle Sharp, 2 wins, 3rd Molecomb St. (Gr.3). Broodmare. - CARNIOLA, 4 wins, Prix Rose de Mai (L.) and 335 000 FF. Broodmare. - STOROEN (Mtoto), 4 wins, 211 500 FF. - Caxton Star (Soviet Star), 6 wins, 3rd Grand Handicap de Deauville and 830 982 FF. - CEDAR GROVE (Relko) 2 wins. Sire. - JOHN FRENCH, 5 wins, Gordon St. (Gr.3), 3rd Benson and Hedges Gold Cup (Gr.1), Princess of Wales St. (Gr.2) and won 58 034 pounds. Sire in Australia. - Flamingo Pond, 3 wins, 2nd Radley St. (L.), 3rd Virginia St. (L.). Broodmare. - DERRYLIN (Derring Do), 6 wins, Horris Hill St. (Gr.3), Ascot 2000 Guineas Trial (Gr.3), Greenham St. (Gr.3), Clarence House St. (L.),Washington Singer St. (L.). Sire. - Fiesta Fun (Welsh Pageant), see above. - TREASURE HUNTER (Full of Hope) 10 wins, 45 683 pounds in flat and jumping races. - ANDROS (Borealis), 8 wins in GB and Denmark (Doncaster Produce St.). Sire. - FIDEL 4 wins, Newbury Autumn Cup Hdp. (L.). Sire. - JULIETA 2 wins, Orleans Nursery Hdp. (L.). Dam of winners. - Havana, unplaced, 2nd dam of EDELITO 4 wins, Gran Premio Nacional Derby (Gr.1), Gran Premio Criadores National (Gr.1) in Uruguay ; LEGADOR, Premio Ensayo (Gr.2) in Uruguay. - MURRAYFIELD 9 wins, Coventry St., 3rd Dewhurst St., Sussex St. Sire. SELECT PRINCE 4 wins, Champagne St. (Gr.1) in Australia. Sire. - HO HAN WAI, 3 wins, Prix Corrida (Gr.3). Dam of winners. - Tobago (Borealis), 8 wins, 2nd Oxfordshire St. (Gr.2), 3rd White Rose St. (Gr.3). Sire. - ANTIGUA (Hyperion), see above.